I know there are a million versions of cheesy potatoes out there, but for some reason these seem to stand out. I am not sure I have ever taken them to an event without being asked for the recipe. 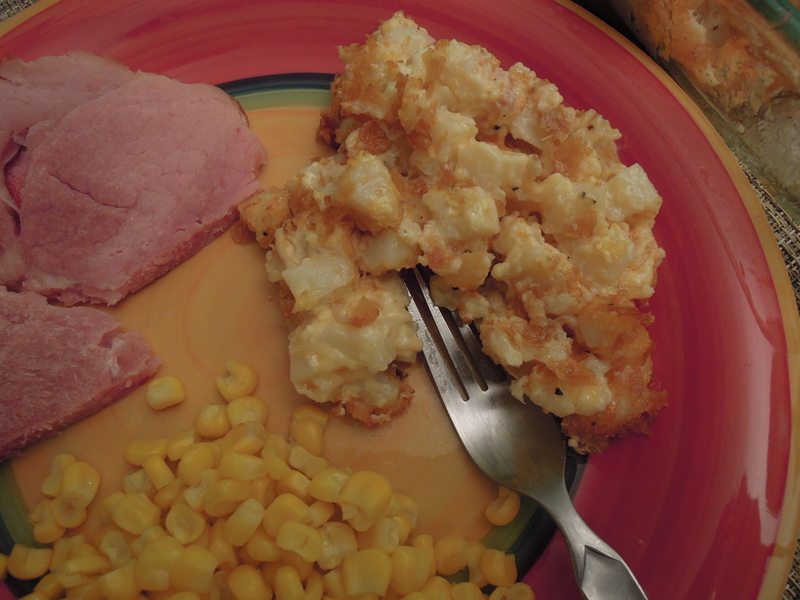 I have served these as a side dish with ham for a holiday meal, but I have also made them for brunches and breakfasts. People love them. 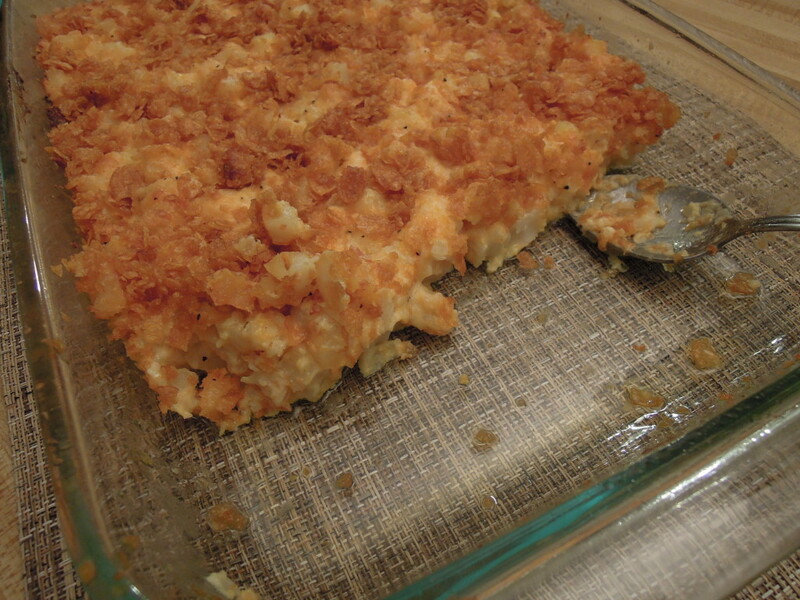 They are cheesy, creamy, buttery, and topped with a crunchy corn flake layer. 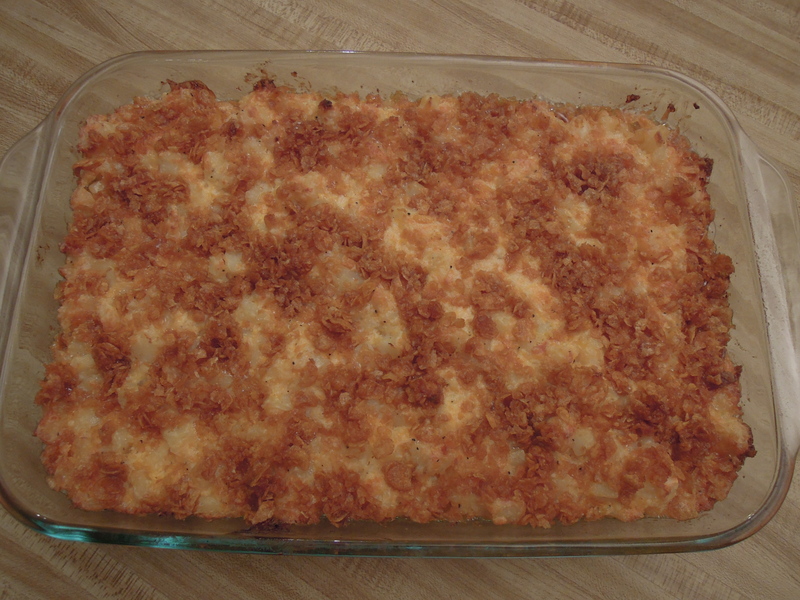 I am not sure why this version of cheesy potatoes is called “Texas Potatoes.” I got the recipe from an old friend who had lived in Texas before she came to Colorado, but I have no idea if that has anything to do with the name. 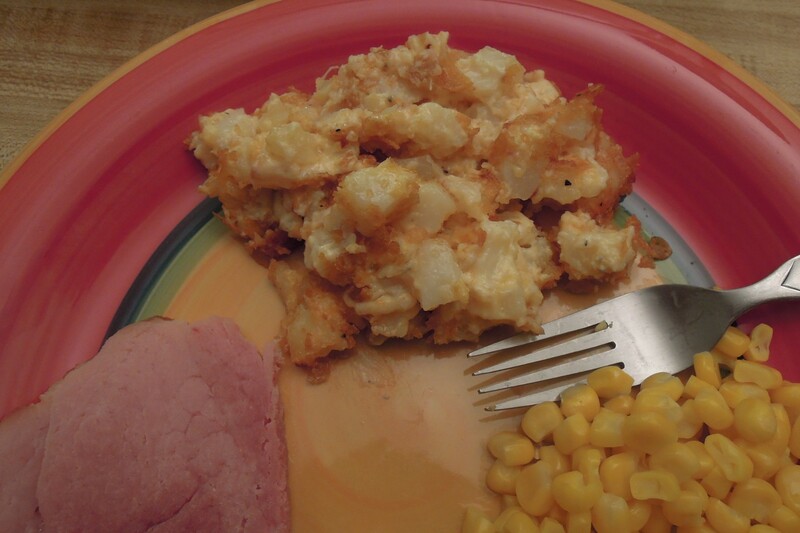 Texas Potatoes, Cheesy Potatoes, Crack Potatoes…A potato by any other name would taste as…divine?…cheesy?…good?…. Whatever. They are good. Make them soon. 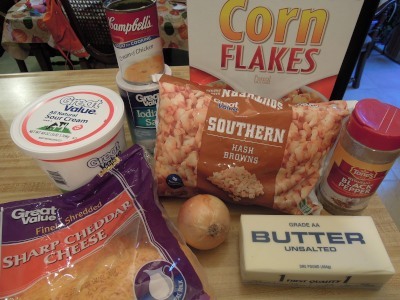 Combine sour cream, soup, onion, melted butter, and cheese in a large mixing bowl. Add potatoes and stir to combine well. You will need to break up any large chunks of potato with a wooden spoon. When potatoes are well combined, dump them into a 9 x 13 baking dish. If you are going to bake the potatoes immediately, make the topping by melting 1/4 cup butter and combining with crushed corn flakes. Sprinkle evenly over the top of the potatoes. 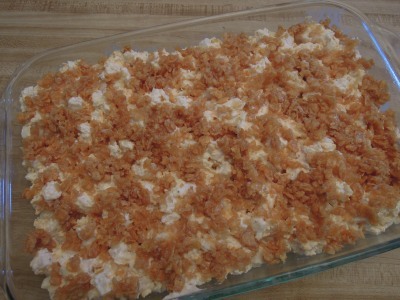 If you are not going to bake the potatoes right away, wait to make the topping until just before the potatoes go in the oven. Bake uncovered at 350 for 75-90 minutes, or until bubbly and heated all the way through. Notes: There is room for a lot of flexibility with these potatoes. 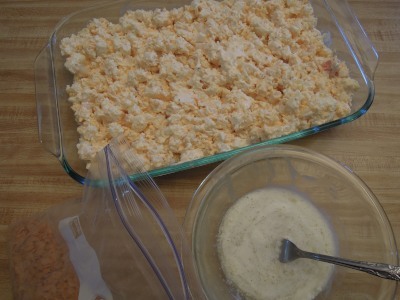 I sometimes mix them up a day in advance and refrigerate them until ready to bake. Since the potatoes will have had time to thaw, the baking time is a little less. 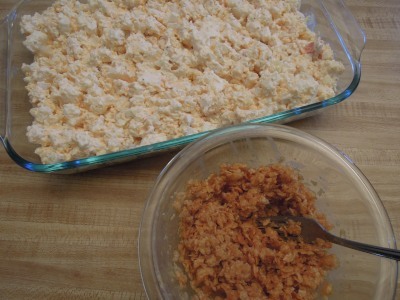 You can divide them into two smaller pans and freeze one unbaked to use at another time. The cooking time and temperature are flexible. I usually make these with ham which bakes at a lower temperature, so I just put them in with the ham and take them out when they are heated through. If you are using a higher temperature, just keep an eye on them and take them out sooner. It printed too many unwanted pages of pictures and the recipe was printed too small to read. You should learn to use your printer then & print off of the “Print Friendly” icon. 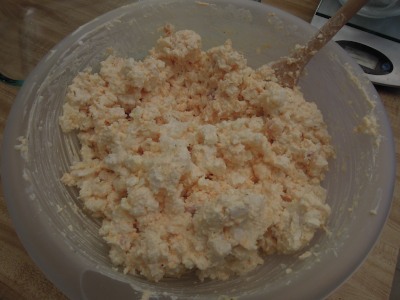 One of the better recipes I have found for this dish. Great job!